I had such an amazing time working with these talented local wedding vendors in Tampa, Florida! We all gathered together at The Orlo in downtown Tampa and magic happened, friends! Check it out here! Oh gosh, friends! This was an absoultely incredible day! I am so honored and excited to say that a local Tampa vow renewal inspiration shoot I was a part of is featured on The White Wren! Ahhh! Thank you so much, White Wren, for the publication! Also thanks so much to all these amazingly talented wedding vendors who helped make this day happen! Danette and Adam have been married for almost 18 years now and they have such a deep love for each other that you can just feel it when they're with each other. They have four beautiful boys together and their passion for their marriage and their family is so inspiring. They were the perfect couple to model for us at this vow renewal inspiration! Also as a fun fact side note, Danette is actually Mrs. Virginia USA in 2014! Wow! That's amazing, right?! She's such a sweetheart and so is her hubby, Adam! Check out our video from the gorgeous and special day here on the blog! For best quality, watch in 1080p HD or click the HD button in the right corner if you're on a mobile device. 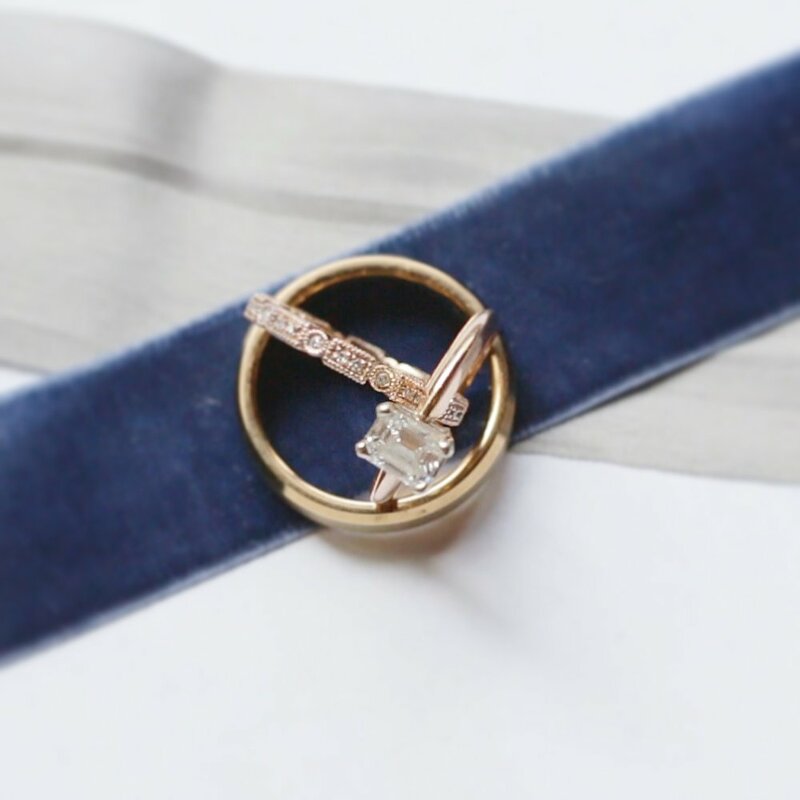 Ring box: Aldona Styling Co.
Kemari and Jacob of Kemari Lyn Films are a husband and wife wedding videography team based in Tampa and Orlando, Florida and serving the joyful and wildly in love in Central Florida and worldwide. Dreamy couple and a dreamy day, amiright?! Oh yes, I am! haha Below, you can check out this French vintage and ultra violet wedding inspiration shoot hosted by TAWP at Lewiswood Farm in Tallahassee, Florida! The TAWP (Tallahassee Association of Wedding Professionals) wedding inspiration shoot this month was absolutely breathtaking! This day was amazing from the incredible design to the gorgeous florals to the nod to the Pantone color of the year (ultra violet) to this stunning and sweet couple! Polly and Eli have such a strong love that you can truly feel when they're around each other. Also their smiles and laughter totally spreads joy to everyone around them! I had such a good time working alongside TAWP's talented wedding vendors. I feel so lucky to call these wedding industry powerhouses my friends and it's always a pleasure working with them! Also hey, did you know that TAWP is actually hosting a wedding show ( The Perfect Wedding Show presented by TAWP) this Sunday, March 4th at Lewiswood Farm?! It's gonna be a good one, friends! In the meantime, check out this wedding inspiration film I put together from the shoot earlier this month and watch in 1080p HD for best quality. Kemari and Jacob of Kemari Lyn Films are a husband and wife wedding videography team based in Tampa and Orlando, Florida and serving Central Florida, North Florida, and destinations worldwide. We'd be so happy to get in touch with you about how we can handcraft special films for your wedding or elopement! Ahh yay I'm so excited to share this film with you! Ali and Charlie, you two are an absolutely beautiful couple inside and out. It was so amazing to hear your vows and see your love for each other! When I was editing, I was like dang, they are so clearly in love. Every single clip I had the pleasure of filming emitted such joy and intimacy. You two are awesome! So this styled elopement all came together thanks to Caroline at Moonstruck Florals. Her floral arrangements and designs are such an inspiration for me as a wedding filmmaker (and as a person because I'm obsessed with flowers)! She designed and coordinated this styled elopement so wonderfully and it was so perfect to have Ali and Charlie, who are newlyweds, to be a part of this inspiration shoot. This day was so amazing and really sparked me creatively! Check out their elopement highlight film here and watch in 1080p HD for best quality! Yay! Kemari and Jacob of Kemari Lyn Films are a joyful husband and wife wedding videography team serving North and Central Florida, South Georgia, and destinations worldwide. 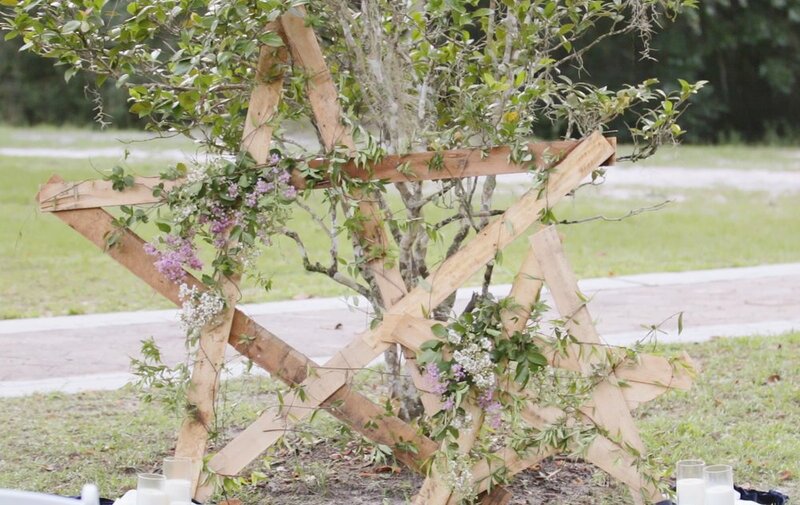 Kemari and Jacob of Kemari Lyn Films are a joyful husband and wife wedding videography team based in North and Central Florida and serving destinations worldwide. Check out our highlight film below from their intimate vow renewal and watch in 1080p HD for best quality! Serving Tallahassee, Tampa, North & Central Florida, South Georgia, and destinations worldwide. We love working with couples that are wildly in love! We'd be so happy to get in touch with you about how we can create special films for your special wedding or elopement. We worked on this shoot at the absolutely stunning, Pebble Hill Plantation in Thomasville, Georgia. This venue has such amazing locations and it even has gorgeous horses and a beautiful stable! P.S. I've been riding horses for so many years, so I totally get hyped up when I get to shoot at locations with horses haha. 🐴 All of the vendors that helped put this together were so amazing! Thanks to everyone who helped make this possible and a shout out to Lindsay of Captured by Colson for hanging out with us and snapping some additional photos. I absolutely love collaboration and working on inspiration shoots is such a great way to do that. Not only is it a great time to network and make friends with local vendors, but it is also a great way to try new creative techniques. It was such a joy working with these sweet people and I truly hope to again soon! Want to read more about this shoot from Sarah Brooke Photography? You can check out the photographer's blog post and her photos here! 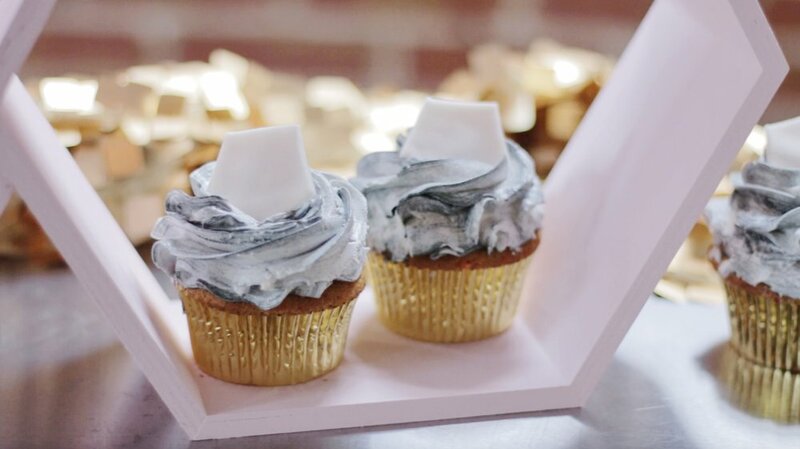 This styled shoot came about when Leanna of Cake Me With You wanted to design a new cake. And let me tell you, this cake came out beautifully! It is such an intricate and rad cake. I was in awe when I first laid eyes on that beauty of a cake. Amazing work, Leanna! 🎂 After Leanna came up with the vision of the cake and the theme, she put together the details of the styled shoot. If you are unfamiliar with what a styled shoot is, it's basically where vendors come together to network, get to know each other and try new things in a fun environment. 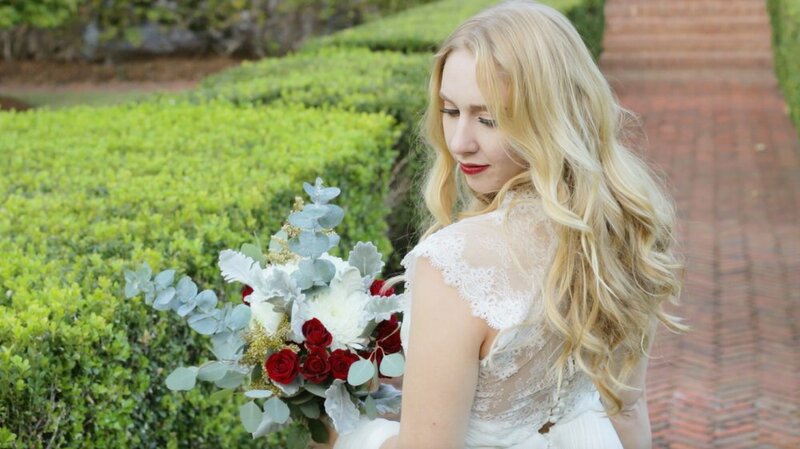 Jasmine, Leanna's sister, was the hair and makeup artist for this styled shoot and she did a great job. Jasmine is fun to work with and is so talented! The couple we worked with is a real couple and they are so in love! Alexis and Josh are getting married soon, too, by the way! Yay! 💕 You can really tell how much they love each other by the way they interact and laugh with each other. They're a really wonderful pair! For this shoot, we were inspired by romance and geometric shapes. As the name of the film and this post entail, this is perfect for a modern themed wedding. ✨👰🏻 Everything down to the tiny details were inspired by this couple's love, fun lines and geometric shapes. Our cookie and sign artist, Katie with Burns Bakehouse, did a really stunning job with her designs. I seriously could not stop staring at her cookies! 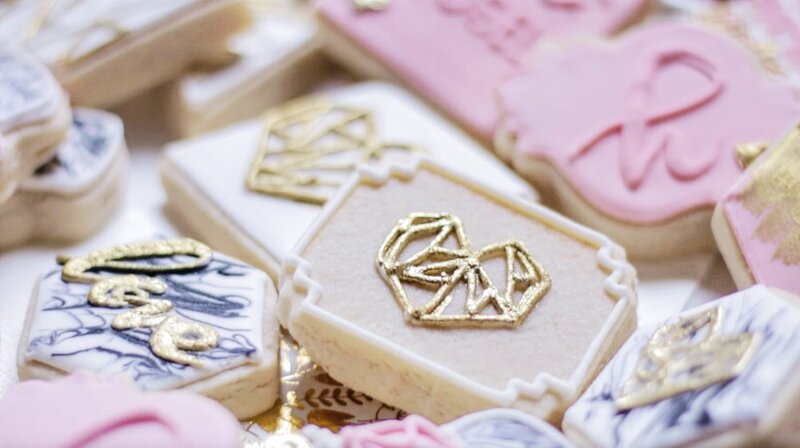 I loved them so much actually that I've been using her to create custom cookies as a welcome gift to my wedding videography clients. She is the bomb! 💣 haha sorry for the silly saying, but she really is fantastic! P.S. Be sure to check out the still frame grabs I pulled from my film and the wedding inspiration film itself below! If you or someone you know is looking to book a wedding videographer for 2017, please connect with me! I also actually have just a couple of available dates in the remainder of 2016, too. I absolutely adore creating wedding films and working with couples! If you're local to Tallahassee or its surrounding areas, I'd love to take you out for coffee and chat! If you're out of town, we can "meet" up via Skype. To check out my latest work, click here! Kemari Lyn Films is a husband and wife wedding videography team based in Tallahassee, Florida. We are always up for traveling to your destination! Tallahassee, North & Central Florida, Pensacola, Destin, 30A, Tampa, Orlando, Atlanta, Thomasville, Valdosta, Georgia, and Worldwide! We came together to do this styled shoot because A) this location is stunning! Goodwood, you're oh so pretty! 🌼🌿 And most importantly, B) to work together, network and grow our talents in a judgement-free zone. I was so happy to be a part of this styled shoot for multiple reasons. One major reason being that the amount of talent this group has is insane! From flowers to cakes to decorations to photos to makeup, this crew knows what's up! I am so serious haha. 👌🏽 I am so inspired by each member of this group and I am also very honored to call them my friends. I was so swooning over literally every detail of this styled shoot! Tallahassee, North & Central Florida, Tampa, Orlando, Thomasville, Georgia, and Worldwide!